The San Francisco Giants have shut out the Los Angeles Dodgers in back-to-back wins and can complete the sweep of a three-game set against their NL West rivals this afternoon. We’ve seen just six runs scored in the first two games in the series, and runs are sure to come at a premium today when both clubs send their ace to the hill. 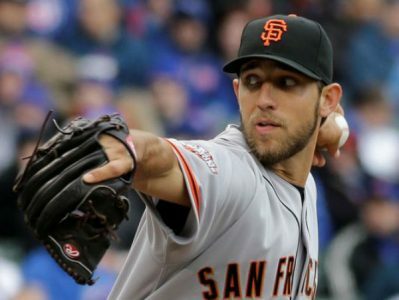 Madison Bumgarner (4-2, 3.20 ERA) will toe the slab for the Giants and he has recovered well from a slow start to the season and gone 3-1 conceding just eight runs on 26 hits over 34 2/3 innings in his last five starts. Last season’s World Series MVP is 8-3 with a 1.94 ERA in his last 12 starts against the Dodgers and 1-0 with a 1.88 ERA in two meetings this season. The Dodgers will send Clayton Kershaw (2-2, 4.24 ERA) to the hill and he knows how to handle the Giants compiling a 1.66 ERA over the last 12 meetings. We can expect both pitchers to go deep, but they will also be backed up by two of the best bullpens in baseball. The Under is 4-0 in the last four meetings in San Francisco, 10-1-1 in Kershaw’s last 12 road starts versus Giants and 5-1 in Bumgarner’s last six starts against the Dodgers. Mike Lundin is one of our ABSOLUTE TOP MLB HANDICAPPERS and a MASSIVE 92-69, +$1566 MLB YTD! Don’t miss out on his ALL EARLY MLB *GRAND SLAM* Thursday (3 Picks) – Three baseball winners for just $60. Don’t forget to sign up for a 30 Days MLB All Access Pass that comes at a steal at $199.95.